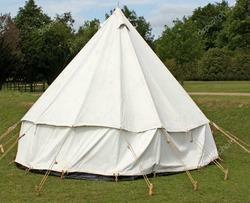 We are providing round Family Camping Tent to our valuable customer. It is a double fly tents of which both the fly are made of good quality nylon and waterproof taffata fabric of vivid colors. 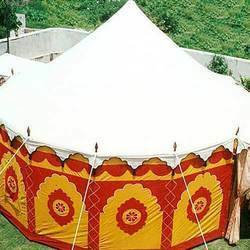 A ground sheet in tetron fabric is attached with the tent along with a window and door. These tents are supported with aluminum folding pipes and steel pins and are packed in a carrying bag for ease in handling from one place to the other. 2-Men Camping Tent:- Double roof tent of "A" shape, 7ft X 5ft X 5ft (L x B x ctr ht. ), aluminum poles, ground sheet of Nylon or HDPE and Nylon ropes. Weight is 10 Kgs. 4-Men Camping Tent:- Double roof tent of "A" shape, 7ft X 10ft X 5ft (L x B x ctr ht. ), aluminum poles, ground sheet of Nylon or HDPE and Nylon ropes. Weight is 12-14 kgs.